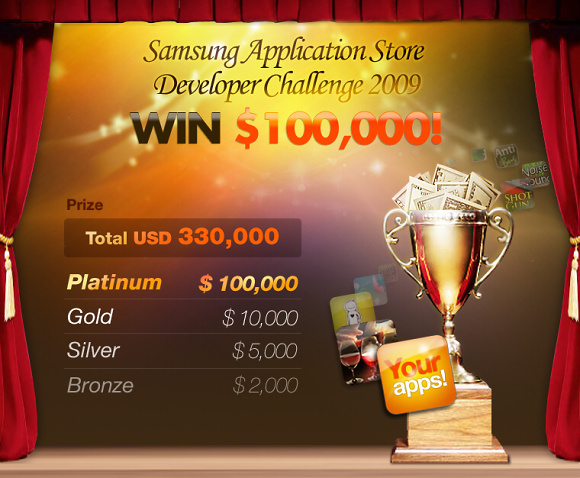 Today Samsung announced their developer challenge for creating the best apps following the launch of the Samsung Application Store in selected countries. The two winning apps will be awarded with a prize of 100,000 US dollars each. With the expansion of their still quite new Samsung Application Store, Samsung wants to stimulate application development and organizing this software challenge is the next logical step. The contest will be opened from 16 November until 10 December for I8000 Omnia II applications in either English or Italian. The first two winning apps in the English and Italian categories will bring their authors 100,000 US dollars each, while their runner-ups will get to split four $10,000 prizes, ten $5000 prizes and twenty $2000 prizes respectively. The total prize fund of the competition is going to be 330 000 US dollars. The only condition for the participation is that all developers should be registered for selling paid applications in the Samsung Seller site that we've covered before in detail. Well, those numbers are surely nice incentives for participating and we hope we'll see some really innovative apps as a result. The winning apps will be uploaded to the Samsung Application Store (free for 4 months) right before Christmas (24 December). Again me. The Samsung gives just 100.000$ dollars for those who make it, but Apple gives you all the money you've earned. Who knows how many millions will Samsung will make with you're app. Because you wouldn't have the author rights!